This will be our last episode detailing the events of July 1st, 1916. It has been several now, this will be our 4th. In the first three episodes we discussed little but completely failures for the British as they tried to move forward against the German defenses. This week, in our last, we will discuss by far the most successful of the attacks on July 1st, in fact the attacks we will discuss today will capture more German territory than the last 3 episodes combined, by a pretty large margin. This will be our last episode detailing the events of July 1st, 1916. It has been several now, this will be our 4th. In the first three episodes we discussed little but completely failures for the British as they tried to move forward against the German defenses. This week, in our last, we will discuss by far the most successful of the attacks on July 1st, in fact the attacks we will discuss today will capture more German territory than the last 3 episodes combined, by a pretty large margin. We will start with the British 13th Corps, the southern most British units where the British attack met up with the French. The French did a fine job in their own attack, and they will occupy the final part of this episode. I need to throw this out there right now, finding good detailed English sources for the French attacks on July the 1st is a bit of challenge. Because of this fact you will note that our discussion of the French, which gained more ground that the British, is very short and not the most detailed. One thing to keep in mind, while you curse at me for my brief overview of their efforts, is that this attack is just a small footnote for the French in their larger story of the war, just one attack in 4 years of attacks. July 1st was not the biggest, it was not the most successful, it was not the most costly, there really was just nothing to make it stand out from all of the other French efforts. They attacked, they did okay, they achieved their objectives, and their attack ended. The best way for me to illustrate this is looking at the official histories of the war. After the war the countries involved went to huge efforts to compile and publish official histories of the war. Generally these were extremely lengthy, spanning over many many volumes. Unfortunately I have only got my hands on the official records of Australia and Austria-Hungary, if anybody knows how I can get a digital copy of any of the others please let me know. Anyway, in the British official history, which I think is about 20 volumes, there is a full 6 chapters dedicated to the events of July 1st, at least according to one of my sources since I have not got to look at it. On the French side, in an official history that is something like 103 volumes, a whole bookshelf in and of itself there are about 5 pages discussing the events of July 1st. In newer sources the French sector of the front often barely gets a mention. In what is probably my best source on French actions, Pyrrhic Victory by Robert A. Doughty which is strictly dedicated to French actions during the war, it has just a few pages on July 1st, and really just a small piece of a chapter on the Somme as a whole. So that is the story on why the British get 3 and a half episodes, and the French just have a half of an episode, something to keep in mind when we get there here in about 15 minutes. We start today with the 13th Corps, the furthest south of all of the British units. The 18th division would be on the left hand side, to the north, and they would try to advance into the small village of Carnoy, then continue past it through a few smaller German positions until finally they would take the Montauban Alley trench line behind and to the north of Montauban. There they would try to fortify their positions and hold it. On the right, and the south, the 30th division would move forward to capture the village of Montauban itself, before pushing beyond it to the next German lines, where they too would fortify and hold their positions. They were looking up at the German defenses on the Pozieres Ridge from in front of Montaubun, a village on the Ridge, and then out onto the Mametz Spur where they would be advancing with the troops to their north. The German defenses in this area had never been as well built up or constructed as they were further to the north. This would greatly benefit the British attack, another thing that would greatly assist the attack would be the efforts of the British artillery. On this part of the front the British Artillery did an amazing job of preparing the German positions for the infantry attack. A good portion of the wire was cut all along the 13th Corps front and in front of the 30th division on the right almost all of it had been taken care of. There had also been enough focus on the German front lines which meant that a good portion of the machine guns had been disabled, in fact many of the German positions all along the 13th's front had been completely destroyed, or at least caved in enough to make them inhospitable. At the center of the objectives of the 13th was the village of Montauban, and it had been completely reduced to rubble. Unlike in other villages that we have discussed further north when this destruction was combined with the destruction of the German front line as a whole, this was actually beneficial and did not just provide more places for the Germans to hide. The final piece of the artillery puzzle was the focus on the German artillery in the form of counterbattery fire. Both the 13th Corps and the French put a huge priority on counterbattery fire and this resulted in the damaging or disabling of a large number of German artillery batteries. This would prevent many of them from properly participating in the defense, and as we have discussed all along this would be a huge advantage for the British. The French artillery would also be assisting when the attack started, at least on the far right of the British attack, as they laid down their own barrage for their infantry and it bled into the German lines to their left. Finally, when the infantry did go forward the creeping barrage actually worked, in this area it actually shielded the infantry correctly, instead of just running away from them. 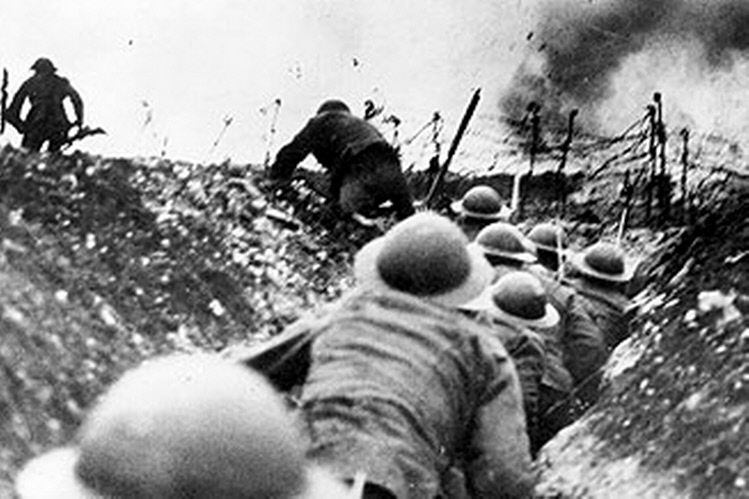 On the 18th Division's front, just like at all points in the line, there would be men who would stay behind in the front line when the attack started for one reason or another. One of these men was Private Cude of the East Kent Regiment, 55th Brigade, 18th Division. He would take the time later to write about what it was like when the men went forward "This must be the beginning of the end. 7.22 a.m. Every gun for eight minutes gave of their best and the din was terrific. Punctual to time, 7.28 a.m., two minutes before the line advances, Captain Nevill, 8th East Surreys, kicks off the football that is to take the boys across to Jerry. Now although the line right and left have moved, I am too busy to take in the surroundings other than our immediate front. East Surreys and Queens go over singing and shouting and the ball is punted from one to another." This act of throwing or kicking a football in front of the infantry was something that was done by a few different British units. It was great for morale, and I am sure the men enjoyed it even if they were chasing the ball into danger. For the East Surry Regiments and the Queens Own Regiment that Private Cude was discussing in his quote above, they would wind up being one of the lucky ones. This football actually had a better than average chance of making it across No Man's Land and into the German lines. In fact, the men of the 18th division got to the first German line, and were able to capture it pretty quickly. After this first step was taken they continued to move forward, pushing through up to 1000 yards behind the front in just a few hours. As they advanced further, the resistance of course got much stronger. The first problem was that the German fire was coming in on them heavy from the north, especially in the line on the far left side of the 18th division where they were still feeling the follow on effects of all of the failures to the north. The second problem was simply one of the dying impetus of the attack. As the men got tired and further away from their start lines the attack began to slow and this was especially true in areas where they ran into some of the stronger and more intact German positions. At this point it was time for the officers to step forward and come into their own. It was entirely their responsibility to identify what was happening and then find a way to continue to push the men forward and onto their next objectives as quickly as possible. That is exactly what Lieutenant Colonel Alfred Irwin of the East Surrey Regiment, 55th Brigade, 18th Division did when he found himself at the front with an attack that was beginning to slow. "When the impetus died down I thought that this was the moment that I might be of some use. I went in and picked up all the chaps I could and went over the parapet by myself, stood well out in the open and said, ‘Come on, come on, come on . . . .!’ They all came on quite smoothly. They didn’t know what to do after they’d taken their first objective but I think I acted properly, but I really don’t know. It’s a very difficult job to know what a commanding officer should or shouldn’t do." The critical piece for all of the British efforts though, and the only thing that let the efforts of officers like Lieutenant Colonel Irwin be successful was the fact that the first sets of infantry were not completely cut off. Unlike to the north there was not a constant stream of German artillery falling between the lines and this allowed the British to move forward reinforcements, supplies, and keep in contact with the leading units. Reinforcing units were able to move forward which allowed them to add their weight and energy to the attack at critical moments, keeping it all going far longer than it otherwise would have. 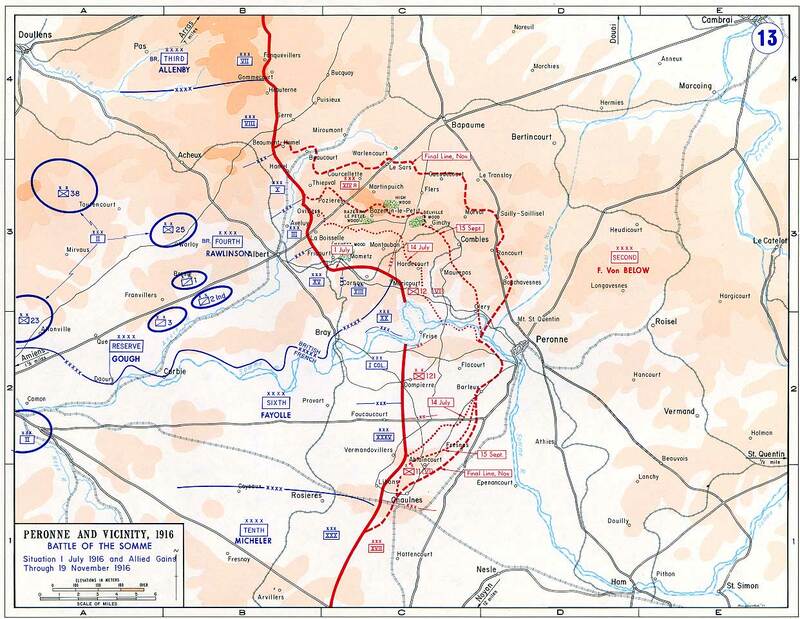 Because of all of these successes the 18th Division's major objectives were somewhat easily taken during the day. They were also able to firmly consolidate all of their new positions, and link up with men of the 7th Division on their left, and the 30th division on their right, they were not going to be pushed back. The 18th had lost some men, as expected in any attack, but for the most part the 18th Division's attack went off about as perfectly as could be hoped, and they would be the first division to achieve their objectives for July 1st. There would be many more to the south. When the 30th division went forward they encountered both machine gun and artillery fire, but it was a mere fraction of what other British units had experienced on other parts of the front. On the left, the 21st Brigade quickly advanced to the first set of German trenches. Private Albert Andrews of the Manchester Regiment, 21st Brigade, 30th Division would be one of those men in the first few units to go forward. Here is him describing what happened when he and his unit got to the German positions "we both bombed the dugout and turned round to go along the trench, when three fine Germans came running towards us with their hands up. They would be about 20 yards away. We both fired and two fell, my mate saying as we let go, ‘That’s for my brother in the Dardanelles!’, and as he fired again and the third German fell, ‘That’s for my winter in the trenches!’ We walked up to them and one moved. My mate kicked him and pushed his bayonet into him. That finished him. This kind of thing was going on all along the line, no Germans being spared. Wounded were killed by us all. We hadn’t exactly been told, ‘No prisoners!’ but we were given to understand that that was what was wanted." On the right the 90th Brigade was headed directly towards Montauban. Before they got to the village they would have to advance up a slope that the village sat on top of, similar arrangements had doomed so many other British attacks already on July 1st. As they started their advance, the German defense was so weak that not only was the advance able to easily continue, but before the planned smoke screen came down Private Pat Kennedy of the 18th Battalion, Manchester Regiment, 90th Brigade, 30th Division had time to take a gander over to his right, there he could see that the French were advancing as well "As we were going over I could see the French troops advancing on our right. It was a splendid sight to see them, in their coloured uniforms and long bayonets. They advanced in short sharp rushes and they seemed to make very, very good progress. There artillery was giving them plenty of support and as they vanished in the distance, I turned round to some of my comrades and said, ‘They’re doing very well, very well indeed!’ And they did you know!" As the 90th Brigade continued to advance toward the village they found themselves covered in a dense smoke screen, which I am sure was somewhat comforting, even if it was a bit confusing. In a matter of minutes the attack had started, succeeded, and the village was in British hands. Again it was the artillery that had been the heroes of the day there had been a good amount of work put into sighting machine guns in the village and then fortifying those positions but the artillery had been able to neutralize almost all of them rendering the defense without its most important piece. Another remarkable occurrence on this area of the front was the fact that the artillery was actually in some kind of communication with the infantry at the front. This allowed the British to actually use both the communication links and the observation posts to actually coordinate the artillery and infantry in a way that had not been possible on other areas of the front, although I guess to be fair the other areas had not advanced far enough to make it necessary. Here is Lieutenant William Bloor of the Royal Field Artillery discussing what happened after the attack started, and it started to succeed "Received news at last from observation post, ‘Attack going OK. 1st, 2nd and 3rd lines taken with few casualties.’ At 9.56 a.m., lifted from Montauban and put up a barrage on the south-east side of the village to check any reinforcements coming up. Batteries in the rear of us who have to advance first, are now limbering up and trotting forward past our guns! Everything is going top hole – awfully bucked! At 10.10 a.m. received word from OP, ‘Infantry have taken Glatz Alley and are now entering Montauban.’" By 11AM the 90th Brigade had completely captured the village, had pushed past it, and had captured all of their objectives in the next set of German positions. They then spent the afternoon frantically digging in and preparing for the German counter attacks. To do this they fixed up some of the German trenches and then tried their best to both link up and build up the defenses of the shell holes. Everybody along the line knew that the Germans would be coming at some point, the only question was how long it would take for them to organize the attack. The Germans certainly were trying to organize an attack, but that was definitely easier said than done in this case. In other areas of the front just small bits of the German positions had been taken and this allowed the Germans to have a good base of solid positions from which to organize and launch their counterattacks. With so much of the first line, and even the second set of positions taken in the south the German situation was far different. Here is Jeremy Sheldon from The German Army on the Somme to explain "Already a sense of desperation was entering into the way the defence was being conducted. The coming days would provide innumerable examples of formations and units being broken up and rushed forward, so that gaps in the line could be plugged somehow: regardless of the consequences for the individuals or sub units involved." Sheldon then goes into more detail about what happened as the Germans tried to move units forward and push them to retake the positions they had lost "men of Bavarian Reserve Infantry Regiment 6, who were spread out in a large arc from south west of Montauban to Curlu. They had been unfortunate enough to have been rushed into the front line positions of the 12th Infantry Division in a piecemeal, uncoordinated, manner to replace the enormous losses suffered by the forward companies of Infantry Regiments 62 and 63 during the bombardment. Instead of being deployed as a single entity, the twelve companies were split up and initially put under command of officers from the two Prussian regiments. This meant that there were no clear orders, chain of command, communications, rationing or ammunition resupply." When the attacks did come, even though they were disorganized, even though they were costly, there was still real danger for the British units. Here is Private Pat Kennedy again "When you saw the Germans coming to you with fixed bayonets. The old Sergeant who had been out since Mons, he said, ‘By God, Pat, if they get any nearer, we’ll have to go and meet them with the bayonet!’ I thought, ‘Right! I’ve got a round in my breech, in case I miss him with the bayonet, I can shoot him! Just pull the trigger catch him that way. But they got very near on top of us – a few feet away from us and they were coming full pelt, yelling at the top of their voices. It’s a nasty feeling to think of these big Germans, all picked men, they were regular troops, done years and years conscript service. But really, they were on a level with us because it was their first field action they were in, I think." All of the counterattacks were failures with the British able to beat back the counterattacks through a combination of artillery shells, machine guns bullets, and steady nerves. Overall, the 30th Division would achieve all of its objectives on July 1st, while losing the least of any British division. The success of the 13th Corps was huge, it had achieved so many of its objectives for July 1st, and for these successes it had to pay just 3,000 casualties from both the 18th and 30th divisions. It is crazy to think that this was about half of some of the divisions to the north, divisions that had achieved far less. Before we say goodbye to the British attacks, I have this quote from Lieutenant Colonel Frank Maxwell of the 18th Division. I like it, and I wanted to find a way to include it earlier in this episode, so I am doing it now, "As the reserve battalions moved forward they were shaken by the sheer horror of the sights that surrounded them. A battlefield in the old days, even though casualties were often far greater, must have been a clean, sweet business compared to one these days. The area over which it is fought is merely the face of God’s lovely earth wrecked beyond recognition, except as a plague of volcanoes. Everything about the thing is unlovely and rather dreadful; and to those who are at all weak in the stomach, very dreadful and altogether unbearable. And there are a great many to whom, at any rate in cold blood, it is intolerable. I have two officers both shaken and now useless from mere sights and I suppose there are plenty of men the same." The French attacked on the southern end of the Somme front. Their area of the front was actually split by the river itself. This arrangement seems positively mad to me, it seems crazy that the British front would not extend all the way to the river, but troop numbers was probably the problem, and the French did not seem to have any great difficulties because of the river running through their lines. 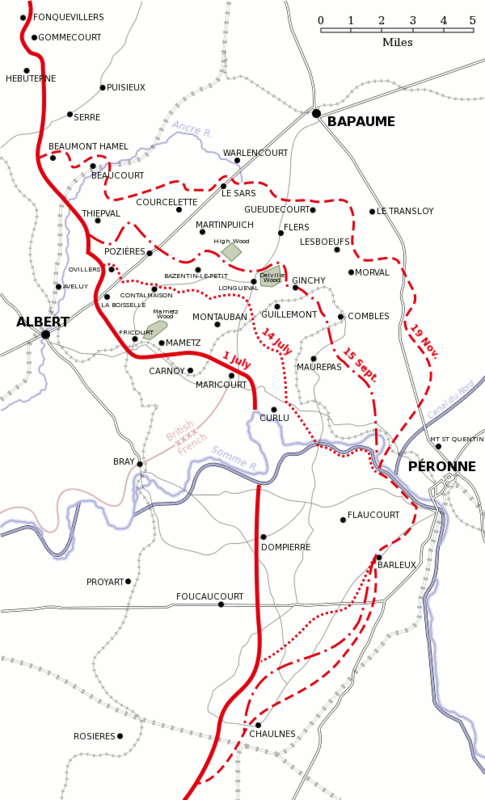 The French 20th Corps would be positioned north of the river, and they would advance with the British 30th to its north, the hope was that the two units were able to advance hand in hand. To the south of the River the 1st Colonial Corps and the 35th Corps. We will start with the events north of the river where the French went forward at 7:30AM and when the whistles sounded the French soldiers jumped out of their trenches, gave a yell, and off they went. This attack was greatly assisted by the artillery and there was little German resistance in the first positions. When I say little resistance, the first set of trenches were captured in just 20 minutes, and in an hour the 20th Corps had captured all of their objectives. On the German side, they had been hit hard by the artillery, one Field artillery regiment had 15,000 rounds of French artillery hit their positions before the attack and with this fact in mind it is easy to see how they would be unable to really provide any help to the front. As it was small groups of German defenders were able to hold onto a few positions, but those groups often just found themselves bypassed and surrounded, after this happened it was just a matter of time before the end came. By the middle of the afternoon even the stoutest German positions had been captured with everybody inside either killed or captured. To the south of the river the story was much the same. The French had just completely overwhelmed the German artillery. The only change on this part of the front was the fact that the attacks did not start until 9:30AM, instead of 7:30AM on the rest of the front. The French had always wanted to delay the attack until 9:30, and had only agreed to the 7:30 start time for the 20th Corps at the insistence of the British. The 1st Colonial Corps and the 35th Corps had the same type of success with the first line taken in just 15 minutes. By 3 hours after the start of the attack the French had reached their objectives and taken thousands of prisoners with very few casualties. The attack for these two French corps went exactly like the entire attack was supposed to go, but didn't. The German positions had fallen so quickly that they were unable to even communicate back to the rear about what had happened. 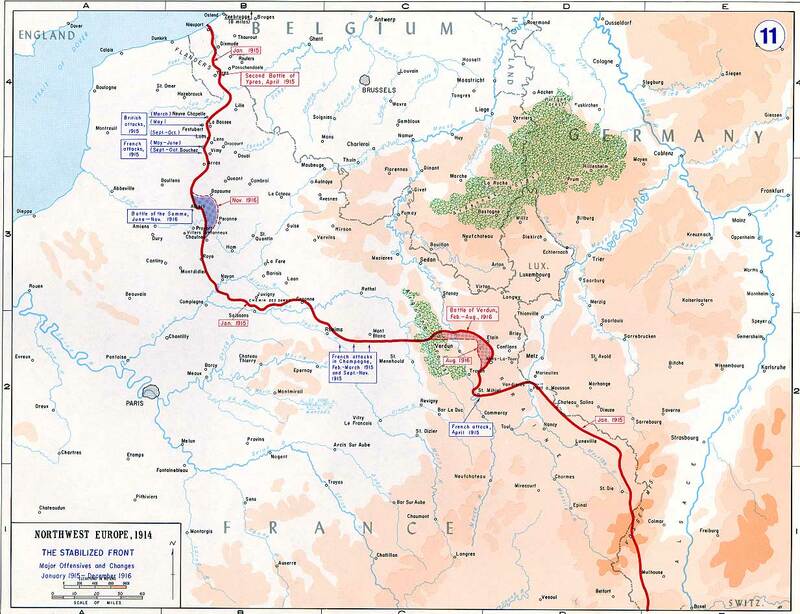 All that the German officers knew was that their first line positions no longer existed, and they rapidly began to take the only action they could, preparing the second line as the primary line of resistance. In just a few hours men had been rushed forward into this line and when the French reached it they found it to be a much tougher nut to crack. The Germans were able to stop the French attack, even though the units in the line represented just a hodge-podge of units, with everything available thrown into the line. So, why had the French been able to capture all of their objectives, and capture 4,000 prisoners to boot while sustaining a reasonable number of casualties when things had went so poorly for the British? Well part of the answer is the French themselves. The troops that were being used in this attack were not green troops straight off the boat from Britain like many of the British units, many had been in action before. They had also properly prioritized their artillery fire onto the correct targets. But part of their success was attributable to German actions. The German units to the south of the River were extremely weak, there were just 3 divisions to the south of the river to face two entire French army corps. Joffre does a good job of describing why the Germans were so weak across from his troops "The Germans did not believe that the French, just emerging from the Verdun battle, would be capable of starting an offensive on the Somme…They had therefore taken more precautions along the line facing the British, and this accounts for the more violent reactions which took place on their part of the line." If you remember back to earlier episodes, June was around the time that the French were still in a really rough spot at Verdun, the Germans were still attacking and the French counter attacks had not yet really started to get rolling. Because of this the German generals, all the way up to Falkenhayn, still believed that the French were on the brink of defeat. They caused him and the other general to mostly discount the chance of a concerted French effort to the north or the south of the river even though they could see some of the buildup. I don't want to talk too much away from the French though, they had managed to easily reach their objectives on their entire front, advancing 1 and a half kilometers in some areas when most of the British troops could not take a single yard of ground. It was an impressive feat. Next episode we will dig into the aftermath of the first day of the Battle of the Somme and sort of take back and summarize and analyze all of the things we have discussed over the last month.